No, I'm not expecting...and honestly don't know anyone who is! 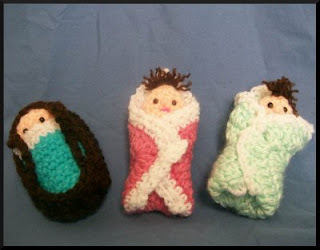 The idea for the baby shower favours hit me, believe it or not, while I was laying in bed with a migraine. That's usually not the time ideas hit. The baby in basket hit me while I was working on the babies in the blankets, one of those lightning bolt ideas I've mentioned before. Pattern will be available soon! 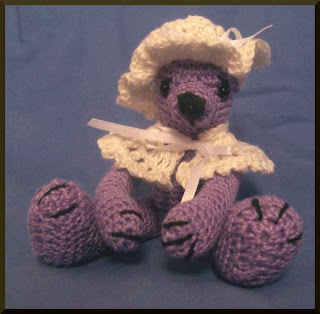 Also coming soon, a new thread Teddy Bear. I kind of like this one, made 3 now, 1 of which is on its way to a new home (the one shown), two of which are waiting for some kind of adornment.